There’s several drawbacks with this code. The major drawback is obvious: the code is repetitive! It expresses the same simple mapping from sort order to text twice, once in each direction. This is tedious. Another drawback is that is a potential source of bugs if I make a typo. SinglePiece does have an obvious property for testing: fromSinglePiece . toSinglePiece == Just. I also need to make sure I cover all the possible sorting values. The nice thing about toSinglePiece (rather than using a lookup table) is that if I use the GHC flags -fwarn-incomplete-patterns -Werror, it will warn me if I miss out a case. So if I add a new sort order, say Author, and forget to change toSinglePiece, I’ll get a compile-time error as soon as I try to compile (which is quicker even than a test). But fromSinglePiece doesn’t have the same advantage: if I forget a new case for Author, I’ll only know about it because of my test. We use Enum and Bounded to get the list of all possible inputs, then form a lookup table which we can reference to find the inverse of a value. So now we’re able to write just toSinglePiece, and automatically derive fromSinglePiece. No repetition and less possible source of mistakes. The only problem is that invert might be a bit slow. Instinctively, it feels like the lookup table can’t be as fast as Haskell’s built-in case structure. 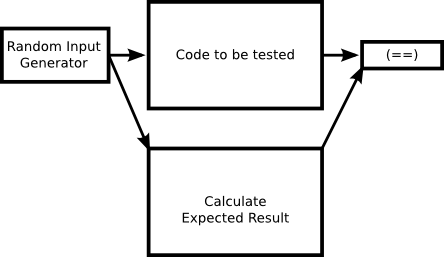 To find out, let’s whip up a test using the Criterion benchmarking library. I’m testing the performance of fromSinglePiece on the three valid URLs and one invalid, i.e. So the difference in speed is only around 10%. I can accept that cost in order to not repeat myself everywhere. Obviously, many types used with SinglePiece are not a trivial conversion between a type constructor and a text value, but for those that are, I found this trick useful. underneath it all, there is the IO monad, which must be lifted correctly. CHP is a monad with side-effects: quite aside from the communication with parallel processes, the presence of lifted IO means that it can have arbitrary side-effects. This means, if my terminology is correct, that we need a check for operational equality rather than denotational. Let’s explore this by considering testing an error-handling monad. The Either type can be used as an error-handling monad by using the Left constructor to hold an error, and the Right constructor to hold a successful return. One property that should hold is that Left e >>= k == Left e. That’s an actual Haskell equality; we can test that property for any function k, and use actual equality on the result. It’s also possible to use a similar error-handling monad transformer. The transformers library offers an ErrorT e m a type that allows you to wrap a monad “m”, using error type “e”, with successful returns of type “a” (with a function throwError :: e -> ErrorT e m a for introducing errors). We can test this using the Identity monad as type “m”, which would make sure the code was pure. But the semantics of this error transformer involve what actions occur in the error monad. For example, runErrorT (m >> throwError e >> n) should be equivalent to m >> return (Left e), but usually m (which is a monadic action) cannot be directly compared for equality. Setting this in the IO monad makes it all much clearer: runErrorT (lift (putStrLn "Hello") >> throwError e >> lift (putStrLn "Goodbye")) should print Hello on the screen, and then finish with an error — and not print Goodbye. Testing this is difficult because we need to have a harness that can check for which side-effects occurred, making sure the right ones (e.g. printing Hello) did happen, and the wrong ones (e.g. printing Goodbye) didn’t happen. This is exactly the situation that the CHP monad is in; we always have IO beneath the CHP monad (which we can’t swap out for a more easily testable monad! ), so we must test equality of code by checking which side effects occurred. We need to check that liftIO_CHP (putStrLn "Hello") >> throwPoison >> liftIO_CHP (putStrLn "Goodbye") prints Hello then throws poison, and doesn’t print Goodbye. Printing text is a difficult side-effect to track in a test harness, but the nice thing about IO is that it has a whole host of side-effects to choose from! So I test by observing alterations to a Software Transactional Memory (STM) variable (TVar) — therefore my test inputs are of type TVar String -> CHP a. The left-hand side of the starred equality is the expected result. The right-hand side is the code (which is of type TVar String -> CHP Char) which should produce that result. So by observing deliberately-placed side-effects in the code, we can check for equality in a side-effecting monad. These unit tests aren’t the only way I’m testing my monad though — in my next post, I’ll build on this to form a more advanced property-based testing technique. Informally, the behaviour is as follows: this starts both processes running (using Haskell’s forkIO under the hood) and waits for them both to terminate and return their results. They can terminate at different times, but the parent process (the one running that composition) will wait for both to terminate before it returns. This parallel composition is not uncommon — for example, the parallel-io package provides a similar operation. In this post I’ll talk about the properties we would expect from this composition, and how to make them hold in CHP — but this easily generalises to making them hold for a parallel composition operator in the IO monad (CHP being a thin layer on top of IO). Finally, I’d expect independence; if I compose p in parallel with q, I would not expect p to behave any differently (or have its environment behave any differently) than if it was not part of a parallel composition. So there are our four properties: commutativity, associativity, the unit law and independence. Let’s consider the behaviour of our parallel composition, to try to make sure it satisifes all of these. If all the processes being composed execute and terminate successfully, all the properties easily hold. All the processes start up, they all run, and when they all complete we get the results back. If one of the processes doesn't terminate, the properties also all hold — the composition waits for them all to terminate, so if p doesn't terminate, the whole composition will not terminate, no matter which order the processes are in, or how we've associated the composition. This is very similar to our first definition, but it merges the values afterwards; they are only returned if neither side threw poison (otherwise poison is thrown). This again preserves all the properties, although associativity may require a little explanation. Consider p <||> (q <||> r). If p terminates with poison, the outer composition will wait for the inner composition to finish (which means waiting for q and r), then throw poison. If r terminates with poison, the inner composition will wait for q, then throw poison; the outer composition will wait for p to also finish, then throw poison. So the behaviour is the same no matter which part of the nested composition throws poison. The wrap function catches any untrapped exceptions from the process, and sends them back to the parent process instead of a result. The merge function prefers exceptions to poison, and only returns a result when neither side had an exception or poison. Asynchronous exceptions can be received by a thread at any time (unless you mask them), without that thread doing anything to cause them. CHP is a concurrency library with its own mechanisms for communicating between threads and terminating, so I don't usually use asynchronous exceptions in CHP programs. But that doesn't stop them existing, and even if you don't use them yourself (via killThread or throwTo) it doesn't stop them occurring; asynchronous exceptions include stack overflow and user interrupts (i.e. Ctrl-C). So we need to take account of them, and preferably do it in such a way that all our expected properties of parallel composition are preserved. (Each circle is a thread.) We must assume, in the general case, that any one of these threads could potentially receive an asynchronous exception (e.g. the system can kill any thread it likes with an async exception, according to the docs). Let’s start by discussing what happens if a child process such as q gets an asynchronous exception directly. One possibility is that q may trap the exception and deal with it. In that case, we're fine — the parallel composition never sees the exception, and since it's been trapped by q, it shouldn't escape from q anyway. But q may not handle it (or may handle and rethrow, which is the same from the point of view of our operator). So what should happen when q terminates with this exception? One possibility would be to immediately kill its sibling (or throw the exception to them). This would completely break independence; r would now be vulnerable to being killed or receiving an asynchronous exception initially targeted at another process, just because it happens to be composed with q. The only way to preserve independence is to treat the asynchronous exception in a child process as we do synchronous exceptions; we wait for both processes to terminate, and then the parent exits by rethrowing that asynchronous exception. 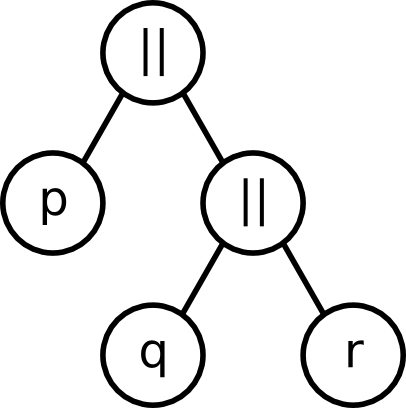 This preserves commutativity, associativity (no matter which of p, q and r get the exception, all will be allowed to finish, and then the outer composition will end up rethrowing it, potentially via the inner composition doing the same) and independence. Our unit law is preserved if p receives the exception (see the next section for more discussion on the unit law). If the user hits Ctrl-C, it’s the parent process that will get the exception, not p or q. We mustn't terminate only this thread and leave p and q dangling. The whole point of the parallel composition is that you scope the lifetime of the processes, and we don't want to break that. We could catch the exception, wait for p and q to terminate and then rethrow it. But if the exception is something like a user-interrupt then it seems wrong to ignore it while we wait for the oblivious child processes to terminate. So the semantics are this: when the parent process receives an asynchronous exception, it rethrows it to all the child processes. This trivially preserves commutativity. Independence is also satisfied; if the processes weren’t in the parallel composition, they would receive the exception directly, so rethrowing it to them is the same effect as if they weren’t composed together. The parent receives the exception, and throws it to its children. The return () process has not yet terminated, this then terminates with an uncaught exception. p traps the exception and deals with it, but when the parallel composition exits, the exception is rethrown from the return () branch; this exception would not have been thrown if p was executing alone, because p would have caught it. The parent receives the exception, and throws it to its children. The return () process has already terminated succesfully. The exception is thus only thrown to p. p traps the exception and deals with it, so when the parallel composition exits, the exception is not visible, just as if p was executing alone. The problem with that is that catch is in the IO monad, and to be part of the parallel composition it needs to be in the CHP monad, which requires a lot of type-fiddling. I’m still thinking about this one for CHP, but if you were dealing with IO, changing the unit to the above would probably make most sense. If the outer composition receives an exception, all is well; the exception is thrown to the children, which includes the inner composition — and the inner composition throws to its children, so all the processes get it. If any of them don’t trap the exception, the exception will be the result of the whole composition no matter which way it was associated — and if all trap it, associativity is still preserved. However, if the inner composition receives an exception, associativity is not preserved; the inner composition will throw the exception to its children but the outer composition will not know about the exception immediately, so only the processes in the inner composition will see the exception. Now it matters which processes are in the inner composition and which is in the outer composition. But this seems morally fair: if an exception is thrown to an inner part of the whole composition, that already depends on the associativity, so it’s unreasonable to expect that the composition can function the same regardless of associativity. Hopefully that was a useful tour of parallel composition semantics in Haskell. Synchronous exceptions are easily dealt with, but asynchronous exceptions (which were perhaps designed more for the forking model of thread creation than this style of parallel composition) make things a fair bit trickier. It’s been a long time coming, but I have completed the final corrected version of my PhD thesis. It’s entitled, rather unimaginatively (and against received wisdom), “Communicating Haskell Processes”. (Communicating Haskell Processes, or CHP for short, is my concurrent message-passing library for Haskell.) A lot of what’s in there has been on this blog before. The new bits are the slightly revised CHP design (which will be in the forthcoming 3.0.0 release) and operational semantics in chapter 3. It’s freely available online for you to read, all 250+ pages. Meanwhile, I’ve also put together a condensed version of the new material — including mobile (suspendable) processes, and automatic poison, neither of which I’ve written about anywhere else — into a paper for the Haskell symposium, which is a more palatable 12 pages. I’m not going to copy out the whole paper into this post, but here’s a quick summary of automatic poison. I haven’t saved masses of code there, but I think the latter version is more readable. Read the paper for more details. Comments are welcome on the paper, which is due on Monday (6th June). Comments are slightly less welcome on the thesis, because it’s already been sent for binding! If there is a mistake, I’m happy to correct it in the online version. The latest issue of The Monad Reader (an electronic magazine vaguely themed around Haskell) was released this week — but rather than featuring technical articles, it’s a special “poetry and fiction” edition. I decided to have a go at contributing, so I wrote a story about programming languages: in particular, what’s important in a programming language. It’s explored indirectly, via a discussion of one of my other interests: films. If you’re interested, take a look. I’m open to feedback on my contribution, and I imagine Brent (the editor) is also interested as to whether the special edition was a worthwhile experiment. I spent some time late last year working further on what I originally called behaviours. It grew much longer than a blog post, so it’s ended up in the Monad.Reader electronic magazine, in the just-published Issue 17. Thanks are due to Brent Yorgey for his careful proof-reading and editing of the article. The accompanying code is already up on Hackage as the interleave package for those who want to play. This week I’m also starting to prepare some slides; in two weeks’ time I will be presenting at PADL 2011 in Texas. That’s a talk that’s on the automated wiring that I’ve covered on the blog before. Once that trip is out of the way, I’m hoping to have a bit more time for Haskell coding again.